It’s over! 19 shows in 2 months – the solo tour of Marie Fredriksson is finished. But there are many things that feel neverending – all memories and feelings we shared on this tour stay forever. We were the first crowd that made people stand up in Luleå – at least that’s what they (the media) say. Starting with the first show in Helsingborg mixed feelings are around – some say it was one of the best shows just because it happened, just because Marie was on stage, performing her own songs, some others missed her talking but very well knew that she seemed to be very nervous that night. In fact, Marie got more and more relaxed from show to show and it felt great to be part of that. We were there for her only, to support her and show the rest of the audience why we were there. Most of the people in the audience didn’t join our cheering and supporting and it felt like they even had problems clapping their hands. At the beginning of the tour we didn’t quite know how and if to stand up and how long. In the end we just did and nobody cared about the reactions of the Swedish people. And yes, in the end it was totally clear we would already stand up during “Kom Vila Hos Mig”, which was the second song of the set. Once, Jokke had told us that Marie feels much better when she knows we are there from the beginning and supporting her to the fullest and so it became like a secret agreement to stand up during the 2nd song. We never stopped it again since then, we kept it till the end. Sometimes we just shared a look with other fans, making a move to stand up and then we stood. It’s hard to choose THE best show since everybody probably has their own favourite night, moment, memory – for me, in Jönköping Marie seemed to be very relaxed, talked a lot, cared less about everything else and just enjoyed herself (and maybe us). In Göteborg the audience was the loudest and the best – it was nice to see that it in fact IS possible to get people stand. Malmö will be in the heads forever, just because Marie didn’t feel well and struggled with her leg. Oh, many would have loved to help her that night. But to see that she never gives up, never ever, that she is just going on, fighting, being strong – it shows a lot to everyone and provides a lot of strength to everyone. No, she didn’t want a chair, no, she didn’t want to stop, so she came back on socks after the break and gave her best. These are the moments when suddenly it’s totally clear why she is such an inspiration for so many people. She is a fighter, always smiling, always going strong. And just, when everyone thought that she is somehow making it on her own (but of course with a lot of help and support of her husband!) she tells us to help her again when the next Roxette tour is on. So it happened after the last show in Umeå. First she promised that we see us soon again and then she said: “You have to help me again.” Ah, yes, we will, we so will, that’s what we try to do all the time and that’s exactly what is my personal story with Marie which I adore for 23 years now. I remember the first show of the Night Of The Proms concerts in Antwerp. I sat in the audience, far away. The lights went down, Marie came up sitting on a stool, walking shyly to the microphone and sang. They started with “Wish I could fly” and she must have had a little blackout back then. She repeated the first line of the song three times. I was shocked, it wasn’t the Marie I remembered. I was shocked for about 20 seconds and then it was totally clear: I wasn’t there for my own entertainment, I was there to support her and it made me buy so many tickets that I saw 16 shows in total in the end. The motivation is still the same – support, support, support, nothing else. But back to this year, back to “Nu!” – we experienced a lot of miracles again, we got a lot of thankfulness of the band and found a whole new world ourselves. There was so much affection from both sides that it will keep us going until the next tour. We heard a lot of wonderful new ve rsions, Så stilla så långsamt, Bara för en dag or Den Sjunde Vågen – just to mention only a few. Every concert had its special moments. Every concert seemed to feature at least one crazy fan that decided maybe 10 hours before the show to come and support Marie, to never let this energy stop. Almost every concert brought some surprises – be it roses, lights, signs or just loud cheering. And every concert was a part of a true miracle. If only Marie knew how many lifes she has saved throughout the years and how many lifes she turned to the better, she wouldn’t believe it. So it feels more than right to give something back, yes, exactly, to give something back. It feels good to know that it’s possible at all. And there is one memory that stays forever – the little talk some fans had after the last show in Umeå. We finally realized that we never really thanked Micke for being the one in a million. We knew there wouldn’t be a chance to do so very soon and felt a bit sad. We said that we at least hope that he knows that we know what he is doing and the we very well appreciate it. Last but not least we take all the wonderful memories of this tour with us – be it meetings (see mine in Umeå with Astrid), great concerts which can’t be forgotten, bad beers after the shows and a lot of nice people on the way. New album and solo tour in 2013? 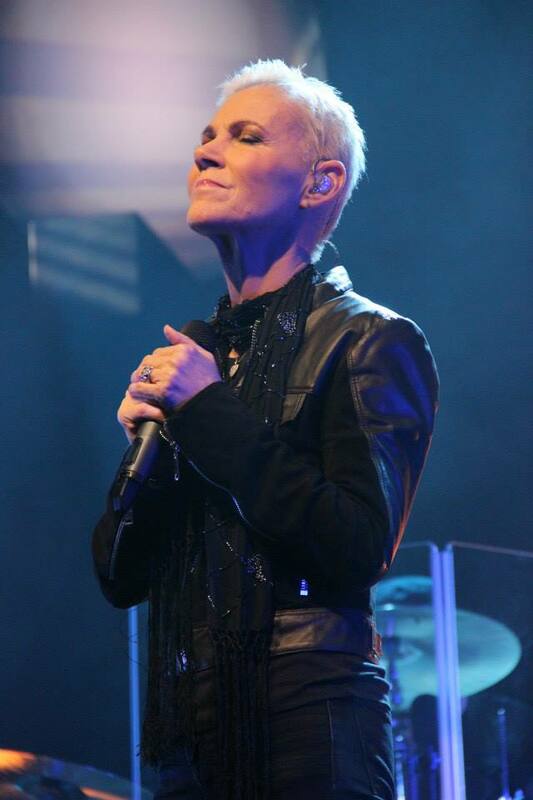 While Marie Fredriksson is still on tour with Roxette until September 2012, there are rumours out that we might get a new Swedish Marie album and a solo tour next year. And this is not only a rumour spread by fans but it was Marie herself who gave that information to Roxette fans some days ago – at least she said something will happen in 2013. So far, this information is not confirmed and we don’t know anything more than that. But if only one of those two rumours is true (album and/or tour) we should feel more than happy!